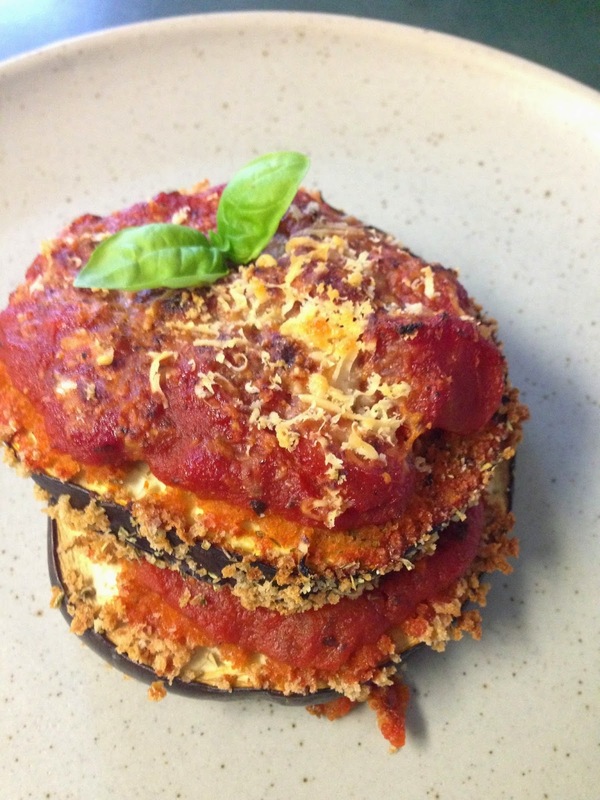 One of my favourite vegetarian meals is eggplant parmesan, but many recipes require you to fry the eggplant before baking it, which adds a lot of extra calories as well as a lot of extra time. This method of breading and then baking it solves both of those problems. I have also reduced the amount of cheese and made it into cute individual stacks instead of a huge casserole, which requires more eggplant. Because there are big, juicy tomatoes in season right now, you could try using a slice of tomato instead of the tomato sauce. 1. Slice eggplant into 10 rounds. Salt liberally and place in colander for 30 - 60 minutes to drain. 2. Rinse eggplant thoroughly with water and pat each round dry on kitchen towel. 3. Preheat the oven to 375 degrees Fahrenheit. 4. In one dish, beat eggs with a pinch of salt. In another dish, mix bread crumbs with Italian seasoning and 1/2 tsp salt. 5. 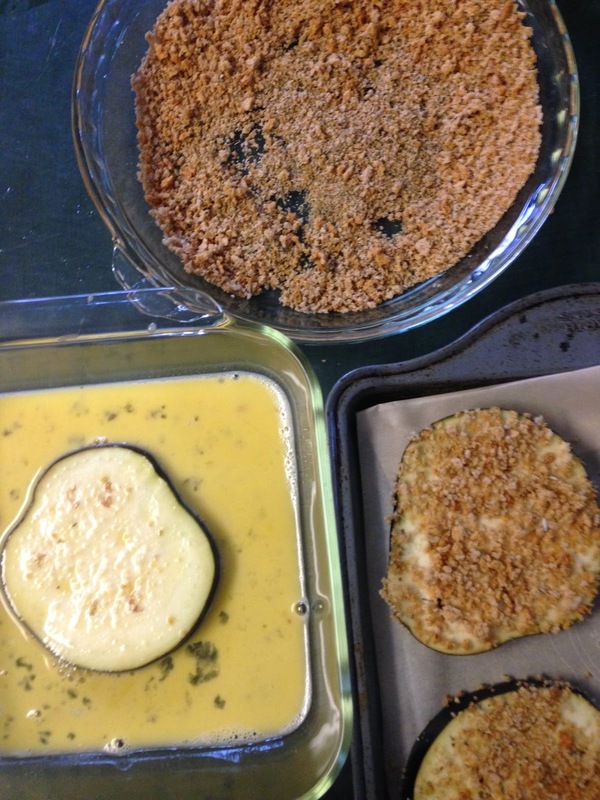 Bread eggplant by using one hand to coat both sides in egg and the other hand to coat liberally with bread crumbs. Place coated eggplant on a parchment-lined baking tray. Bake in oven for 10 minutes on each side. 6. 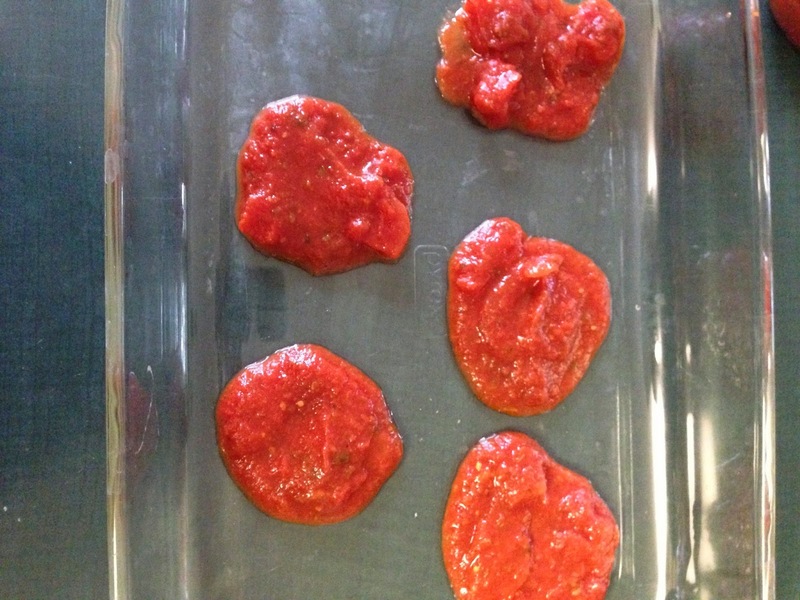 In a baking dish, place 2 Tbsp of marinara sauce in five dollops in the baking dish (5 Tbsp total). 7. 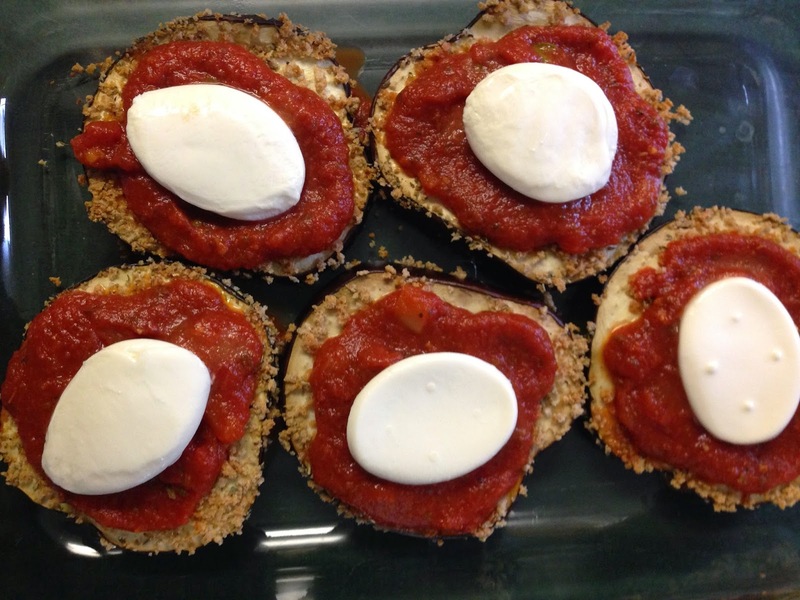 Place a large eggplant round on each dollop of marinara sauce. Top each round with another 2 Tbsp of sauce. Place a basil leaf on each round, then place a mozzarella slice on each round. 8. Top each stack with another eggplant round, another large dollop of sauce, and another basil leaf. Season with pepper. Divide the parmesan between the five stacks. 9. 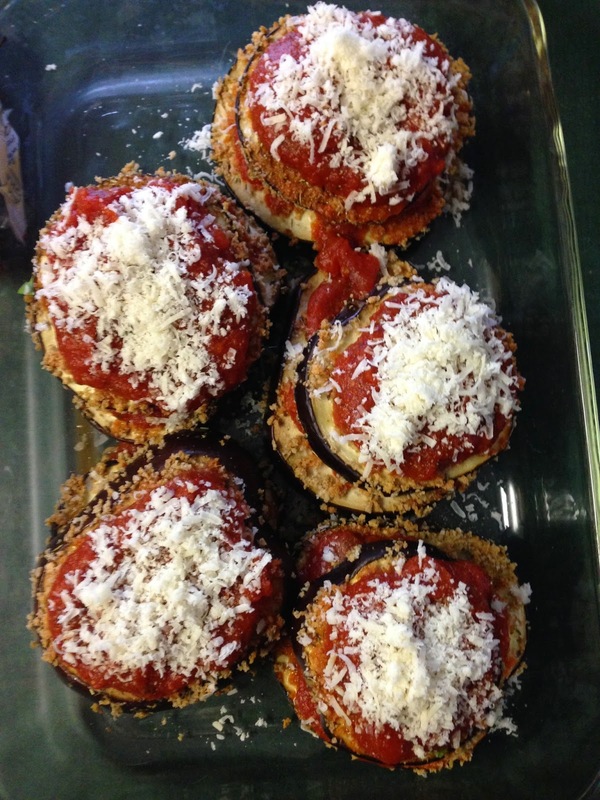 Bake in the oven for 30 - 40 minutes or until eggplant can be easily pierced with a sharp knife. You may want to broil it for a couple of minutes at the end to brown the cheese on top. Enjoy! This looks has my mouth watering! 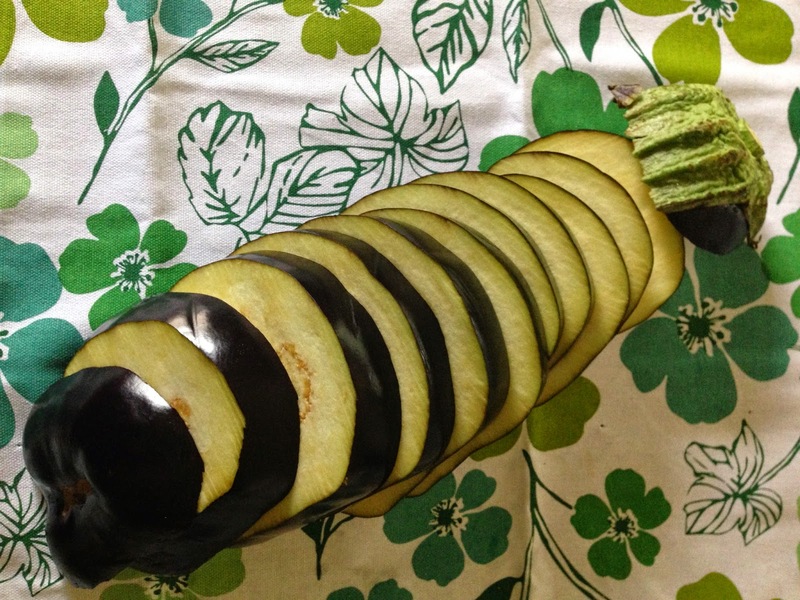 I have recently returned from Italy where I made something very similar, but baking the eggplant first looks like a great, healthy variation on the traditional dish. Now I'm back home in Australia and will just have to wait until eggplants are in season again. I have been longing for the wonderful fresh produce of Italy since I was last there (almost 15 years ago!). 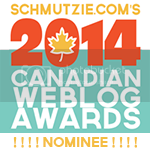 Enjoy the great warm weather while you are waiting - we will soon be entering winter here in Canada!